A cow at Carol and Bill Schuler's dairy farm in southwest Michigan. Bill Schuler stands in front of his cows on his farm in southwest Michigan. "Milking time is kind of like our meal time," says Carol Shuler. "We were more likely to be together during milking time than during meal time." Those two daily appointments with the cows were the fixed poles of their life; everything else had to be arranged around them. There were no weekends off, and no holidays. If there was a big family get-together like a wedding, Bill Shuler says, they'd get there late or leave early. "If you're a small operation and you can't hire help, you're a virtual slave to your farm. You can't get away," he says. To make things worse, recent years have been really tough for dairy farmers. Milk prices have slumped; farmers are eating into any capital they may have accumulated. Some are abandoning the only livelihood they know. Bill and Carol Shuler wondered if their two sons, Billy and Wyatt, would want to stick with the dairy business. Their grandmother, Shirley Shuler, had her doubts. "You couldn't encourage them, because you know it isn't easy," she says. "You know it isn't easy." But a couple of years ago, Billy and his brother, Wyatt, told their parents that they did, in fact, want to be dairy farmers. And the Shulers decided it was time to make a big investment, for the future of the farm and the family. Today, there's a big new barn on the farm. Inside it, 100 cows spend their days lounging on sawdust. And every once in a while, one of them decides that it's her own personal milking time. She strolls down to one end of the barn toward a small, trailer-sized structure. She pushes through a metal gate and enters it, walking into a special cow-sized chamber that holds her in place. A sensor reads her ID tag. A carefully measured helping of molasses pellets — cow candy — drops into a box for her to munch on. And beside her, a robotic arm swings into action, reaching toward her udder. Bill Shuler describes the action. "The first thing it's going to do is, sanitize each teat with an iodine solution," he says. "Then it will go back and put the milkers on individually." As the arm maneuvers the equipment into position, I see red lights flash briefly. "Those are the lasers," Shuler says. "It has lasers. That's how it finds the teats." Even with lasers, it usually takes the robot a couple of tries to attach the milkers. A human would do this much faster. Eventually, though, milk flows though hoses into a big storage tank. One of Bill Shuler's sons is usually here in the barn, but no one has to be, at least not every minute. If something goes wrong, they'll get an alert on their phones. Sometimes, they can fix it by sending instructions to the robot from their phone. They can also see what's happening by checking the video feed from one of 20 cameras set up around the farm. Robots like these are milking a small minority of America's cows — a representative from DeLaval, the company that made Schuster's robots, estimates that it's about 5 percent. But the share is growing. Big dairies are buying them to replace hired workers, many of them immigrants, because recruiting and keeping those workers is getting much more difficult. On small dairy farms, though, which were among the first to adopt this technology, the robots are replacing the labor of the families that own those farms. Instead of displacing people, Bill Schuler hopes that the robots will help his sons stay right where they are, on the farm. "If this technology would have been available 25 or 30 years ago, I'd still have more friends milking cows today," he says. "I have a friend who's a couple of years older than I am. I'm sure he would have robots. He'd still be milking cows today, and his son would probably be there with him." In fact, small family-run dairy farms like this are rare enough these days that Schuler is turning his into a tourist attraction. The farm is open for visitors every afternoon. Tours cost $5 per person, and there's ice cream for sale. Hundreds of people visited last year. Kids love the cows, Schuler says. But their parents are amazed by the robots. On a growing number of dairy farms, people don't decide when the cows need to be milked. The cows do. That's because farmers have called in robots to do the milking - day or night. And for some families - the ones that run small dairies - the robots mean freedom. NPR's Dan Charles reports. 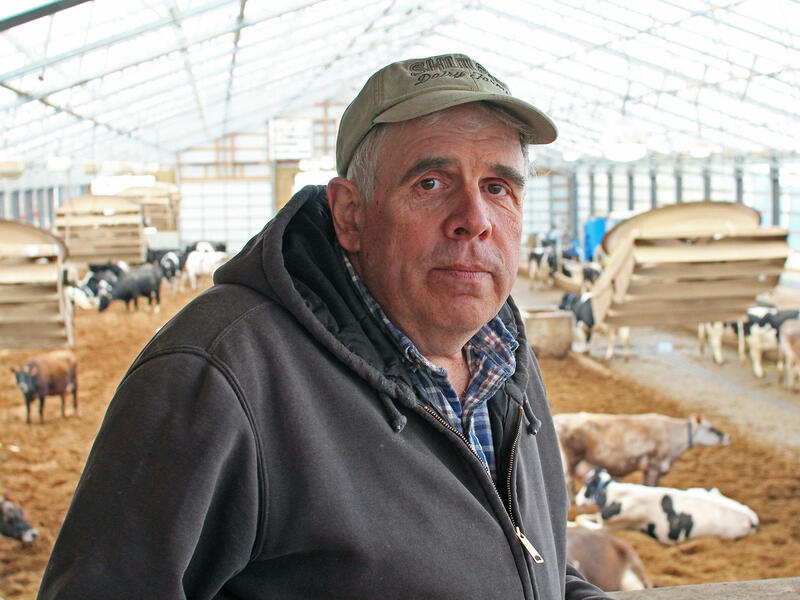 DAN CHARLES, BYLINE: Carol and Bill Shuler and their two sons, Billy and Wyatt, run a dairy farm near the town of Baroda in southwest Michigan. And for decades, family life revolved around milking 40 cows. BILL SHULER: At quarter to four every morning, the first thing we did - we would clean the barn out. BILLY SHULER: We fed the cows. We milked the cows. And then at 3:00 in the afternoon, it all started over again. Feed the cows. Milk the cows. CAROL SHULER: Milking time is kind of like our meal time. You know, we were more likely to be together during milking time than we were during meal time. CHARLES: That was Bill, Billy and Carol Shuler. There were no weekends off - no holidays. If there was a big family get-together like a wedding, Bill Shuler says, they'd get there late or leave early. BILL SHULER: If you're a small operation and you can't hire help, you're a virtual slave to your farm. CHARLES: On top of that, recent years have been really tough for dairy farmers. Milk prices have slumped, as they sometimes do. Farmers are eating into their savings. Some are giving up on dairying. Bill and Carol Shuler wondered if their two sons really would want this life. Their grandmother, Shirley Shuler, really had her doubts. SHIRLEY SHULER: You couldn't encourage them because you know it isn't easy. You know it isn't easy. CHARLES: But a couple of years ago, Billy and Wyatt told their parents they did want to be dairy farmers, and the Shulers decided to make a big investment for the future of the farm and the family. CHARLES: There's a big new barn on the farm now. Inside it, a hundred cows spend their days lounging on sawdust. And every once in a while, one of them decides it's her own personal milking time. She strolls down to one end of the barn where there's a small, trailer-sized building. CHARLES: She pushes through a metal gate and walks into that building into a special cow-sized chamber that holds her in place. 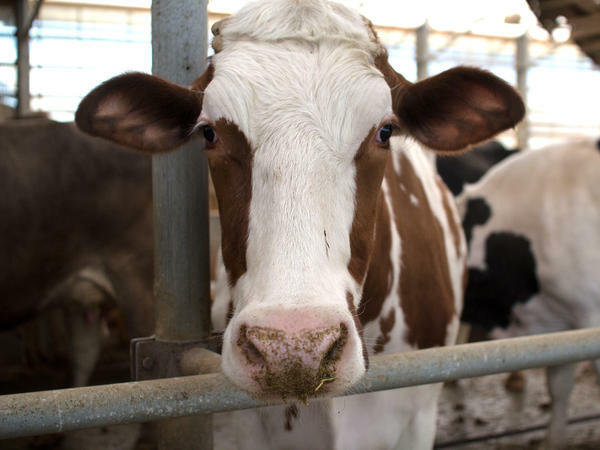 A sensor reads her ID tag, and a robotic arm swings into action, reaching toward her udder. BILL SHULER: OK. So here we go. BILL SHULER: The first thing it's going to do is sanitize each teat with an iodine solution. Then it'll go back and put the milkers on individually. BILL SHULER: Those are the lasers. CHARLES: That's right - lasers. That's how the robot finds the teats. It takes the machine a couple of tries to attach the milkers. A human would do this much faster. But eventually, it succeeds, and milk flows through hoses into a big storage tank. Bill Shuler's sons are usually here, but they don't have to be - at least not every minute. If something goes wrong, they'll get an alert on their phones. Robots are milking just a small minority of American cows - maybe 5 percent. But the share is growing. Big dairies are buying them to replace workers, often immigrants. Small farms have been getting them to replace family labor. BILL SHULER: It absolutely changes your lifestyle. It gives you a life. CHARLES: There's been a lot of talk lately about robots taking people's jobs. Bill Shuler hopes this robot will help his sons stay in the dairy business. BILL SHULER: If this technology was available 25 or 30 years ago, I'd still have more friends milking cows today. I have a friend - he's a couple years older than I am. I'm sure he would have robots. He'd still be milking cows today. His son would probably be there with him. CHARLES: In fact, a small family-run dairy farm like this is rare enough these days, Shuler's turning it into a tourist attraction. Hundreds of people visited last year. Kids love the cows, he says. Older people are amazed by the robots. Dan Charles, NPR News.